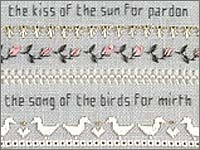 A Companion to Silk Wysteria, this lovely sampler in shades of teal, rose, white and soft greens will lift your heart. The delicate gazebo is covered with a tumble of pretty pink silk ribbon roses. Shimmering soft gold metallic and petite gold beads add sunshine and the myriad floral bands give an impression of a garden in the early flush of Summer. The beautiful poem, "God's Garden", inspires love and gratitude for the peace found there. Model: on 28ct. ConfederateGrey Quaker Cloth this sampler measures 4.5" x 17.5" Cut fabric 11" x 24".